Iris Machine Embroidery Threads are made of top quality raw materials, many of which are manufactured in the United States. Our machine embroidery thread is the only thread of its type manufactured in North America. Iris Machine Embroidery Threads are known for their strength, tenacity, ability to run smoothly in all major embroidery machines, and their brilliant sheen. 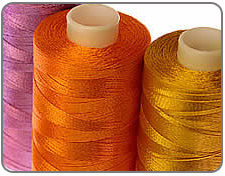 Whether you select Iris UltraBrite Polyester, Iris Smooth ‘n Silky Rayon or Iris Dazzling Metallics, you can be sure our machine embroidery thread is the right thread for you.